This photo is showing a rare appearance of the painted Waffen SS steel buckle (The member of the Waffen SS to the left). To the right a speciment of the more common encountered early type aluminium belt buckle, isssued for general service. 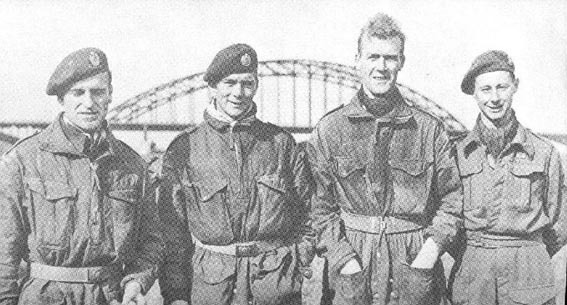 Corporal 'Chick' Weir and corporal Johnning Humphries, British Airborne, are here seen posing in front of the Arnhem bridge, September 17 - 20, 1944. 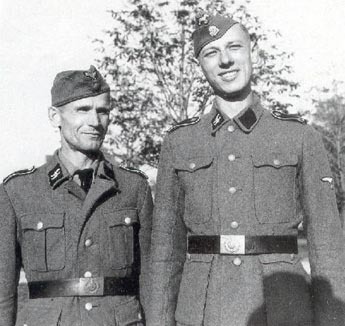 During centuries, the conquerers of battles and wars wore personal items from defeated opponents - a tradition still alive during World War II: Both corporals mentioned are wearing the german army enlisted man's web belt and steele buckle.